Which Graphical Functions Should a Production Planning Table Offer? When it comes to production planning, graphical planning tables provide valuable assistance as to visualizing complex contexts and bringing transparency to production planning data. What are the "basic functions" a graphic planning table for use in manufacturing companies needs to offer to convey meaningful information and support the decision maker and production planner in the best possible way? In this blog post, which is post #1 of a series of three, I discuss three key features that a visual planning table should have. 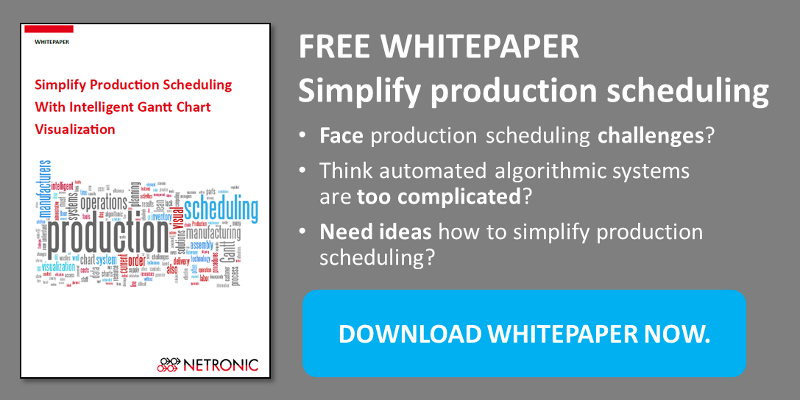 As NETRONIC, our main focus is on developing and providing Gantt charts for planning and scheduling applications and in a previous blog we discussed 8 compelling reasons for visual production scheduling. According to our experience manufacturing companies highly benefit from intelligent planning tables. Here are three features that can ease the typical daily work of a production planner as all of them help him focus on relevant information. Production is no one-dimensional process - so use multi-dimensional views and keep track of the delivery dates in an order view and manage the resource load in a machine view. Planning horizons are never static. Sometimes you may need a rough overview of what to expect in the next weeks while other occasions and decisions needs require that you immediately delve into the daily details. Expand or shrink the timescale with the mousewheel and zoom stepless from a long-term overview into short-term planning. Summarize information according to contents: Production orders together with suborders and operations; departments with work groups and work centers. Use one-, two- or multilevel grouping for creating a general overview and at the same time accessing detailed information after having expanded the respective levels. We will soon publish three further important functions for visual production planning. Subscribe to our blog to stay informed. In addition to this, you can also take a deeper diver and read our free whitepaper how intelligent visualization can simplify production planning.